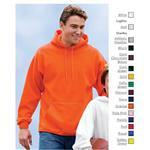 Eco friendly green corporate apparel - soft hoodie light enough for everyday wear, embroidered by Adco Marketing. 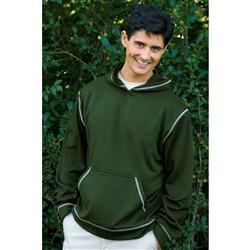 70% recycled polyester/30% polyester, 6 oz. brushed back jersey fleece, 3-piece hood, long sleeves with self-goods cuffs and waistband, front pouch pocket, contrasting triple-needle cover stitching on hood, armhole, cuff, waistband and pocket. Imported. XS-3XL. Price includes 7000 stitches of embroidery! 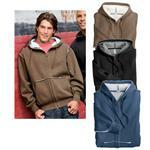 Call 888-332-ADCO for more ideas on eco friendly corporate apparel and recycled logo apparel. Available Colors: Army green, navy, black. Production Times Available: 7 working days. Dimensions: Sizes S-3XL (pricing includes to XL). Typical Imprint Area(s): Left chest approx. 3.5". Available Imprint Options: Front, sleeve, back. Additional embroidery locations add approx. $2.00 depending on stitch count.